In recent years, the popularity of outdoor kitchens has grown by leaps and bounds. Particularly in areas of the country like Florida that enjoy abundant sunshine and good weather almost year-round, adding an outdoor kitchen to a home is a sensible investment. 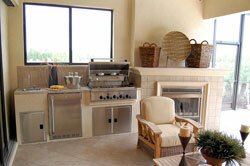 However, the process of designing and then building an outdoor kitchen is a major undertaking. Outdoor kitchens typically require the installation of new lighting, cabinetry, water and gas hook-ups, countertops, and refrigeration units. More so than with your average patio remodeling project, outdoor kitchen installation calls for help from a professional. At Mueller Remodeling, we have been remodeling homes in Pinellas County for more than 30 years and have the expertise necessary to build outdoor kitchens for homeowners throughout the region. If you would like to do more cooking and entertaining outdoors, we can design an outdoor kitchen specifically for you that includes all the modern features and amenities that you want. Contact Mueller Remodeling today for more information about our custom-built outdoor kitchens and to schedule a residentinal remodeling consultation.